Check out other Movies No One Mentions here. The whole inspiration for this column came to me when I was sitting in the New Beverly Cinema watching Sam Peckinpah’s 1971 adaptation of The Siege at Trencher’s Farm. Until about halfway through the picture, I had forgotten that there even was a remake out there in the world. But what really got my brain turning was: why does nobody ever mention the remake? An obvious answer would be, “Because it’s not worth mentioning.” And to that response, I decided to say, “Maybe it is. Maybe a lot of movies are worth mentioning but we never talk about them like we do many other films, be they classics or landmark stinkers. There are a lot of flicks that wade in the middle and get lost.” So, I took it upon myself to watch Straw Dogs (2011) and find out if it is worth talking about. Now, the natural inclination one has with a film like this is to endlessly compare it to the original. That’s bound to happen, but if you make that the focal point of your arguments against it, you really aren’t meeting the movie on its own terms. And on its own terms, Straw Dogs (2011) is a mean-spirited little social horror film that’s a little too blunt at times but not without its merits. It’s clear that writer/director Rod Lurie felt indebted to the original and wanted to keep all the stuff that worked well on paper. The movie is a beat-for-beat remake but relocated to Mississippi instead of Cornwall. 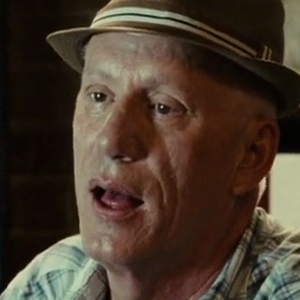 Lurie stocks the film with some great actors – James Woods is playing drunk and angry in every scene, so that’s a gift – and everyone gels with the grungy tone. The standout is Kate Bosworth as Amy; she exudes a toughness that isn’t based solely on sexuality. It’s too bad that she has to spend a big chunk of the climax running around screaming because that’s what happened in the original. A more interesting spin (which is played with slightly) would have been to see her break down into animalistic violence instead of her husband, played by James Marsden. Long live the hairless flesh. And here’s where the movie finds itself in a quandary: Marsden isn’t right for the role. That’s not to say he isn’t good. In fact, he’s pretty great in scenes where he’s trying to puff his chest up around Amy’s old boyfriend, Charlie (an alienesque Alexander Skarsgård). And he can be appropriately dweebish when the camera hits him just right, but all too often he looks like a jock dressing up as a nerd for Halloween. It’s hard to buy him as a dorky Hollywood writer that looks down on all the hillbillies in his midst. His square jaw betrays him. But, what keeps the movie going is Lurie’s surprisingly tight direction and Sarah Boyd’s great editing work. Granted, this feels of its time – the time when The Last House on the Left was also getting a sleek but slimy remake – but it’s not a poorly put together movie. There are some bad bits of studio sheen to the film (the final showdown looks a little too good and has to be much more bombastic) and Lurie isn’t the greatest with making a low budget work to his advantage, but this doesn’t subtract from the movie in a monumental way. However, it is an unavoidably “lesser” film, not only in comparison to Peckinpah’s complicated classic but in its general presentation. You can’t help but see that this wasn’t a priority picture. It feels like a House at the End of the Street (hey, another potential candidate for this column!) or another churned out horror picture. There are some moments of flair – the big kill at the end is a great “gotcha!” moment – but it’s not a movie with a whole lot on its mind. Maybe that’s the fault of Lurie’s script? This version certainly doesn’t have any reverence for its blue-collar backdrop. This is a “Hollywood hates rednecks” flick through and through, and Peckinpah’s version definitely had a twisted admiration for its hard-working scumbags. If the folks doing all the bad stuff were a tad more multi-faceted, maybe this could have risen above its unfortunate remake status. Is It Worth Mentioning? : Yeah, I think so. It’s nothing spectacular but it’s not a bad time. If you divorce yourself from the one starring Mr. Magorium, this is a scuzzy but decent little horror flick. A good bit of beef jerky for the undiscerning moviegoer. Talk to me in the comments about this entry and suggest other Movies No One Mentions!